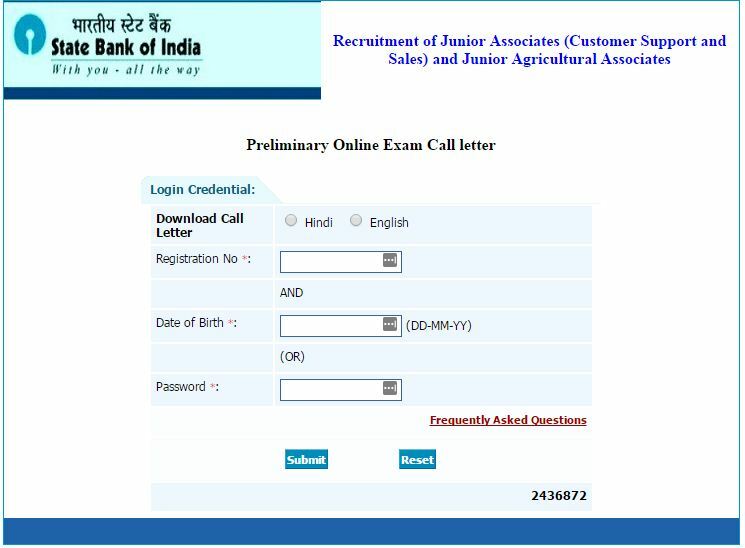 The State Bank of India (SBI) has released the admit cards of the Junior Associates (Customer Support and Sales) and Junior Agricultural Associates in Clerical Cadre preliminary written examination. Candidates who are applied for SBI Clerk recruitment 2016 exam they can able to download SBI Clerk Admit Card 2016 by entering their registration number and password at Bank’s official website i,e www.sbi.co.in. The examination is scheduled to take place from May 22 to June 5 for over 17140 posts. All the candidates are requested to download the same from the official website. State Bank of India Central Recruitment & Promotion Department was published April 2016 for 17140 vacancies on junior associate (customer support & sales) and junior agricultural associates in clerical cadre. The online application form starts from 5th April 2015 and closed on 28th April 2016. And admit card will available for download before 20-25 days of SBI clerk Exam date 2016. The SBI online test for Clerical posts will be conducted on Soon. Candidates will be able to download SBI Clerk Admit Card 2016 now. No hard copy of the SBI Admit Card for JA & JAA Clerk examination will be sent to the candidates. All the candidates need to take print out of the admit card.